The Canadian Embassy in Thailand provides 750,000 THB to fund personal and career development workshops for disadvantaged girls and women in Ubon Ratchathani and Bangkok. Fourth Pratthanadee project funded by Canada Fund for Local Initiatives. Pratthanadee Foundation has received financial support from the Canadian Embassy in Thailand for a project to train and empower nearly 1,300 disadvantaged girls and women. 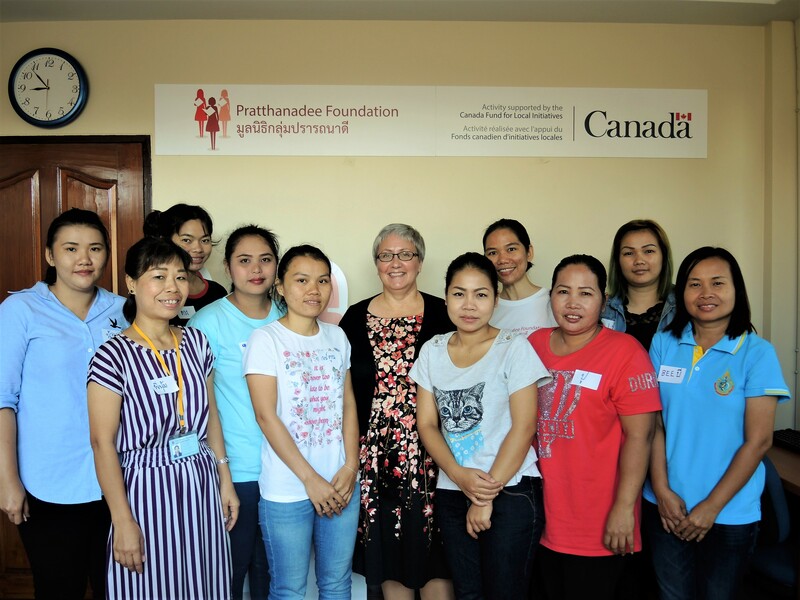 With close to 750,000 THB funding provided under the Canada Fund for Local Initiatives, we will run personal and career development workshops for 1,250 teenage girls in Ubon Ratchathani and 40 women in Bangkok. The outreach in Ubon Ratchathani will be conducted between November 2016 and January 2017 via 20 workshops and 15 mobile knowledge booths to be set up in schools. They will focus on arming teenage girls with knowledge on educational options and career choices after they leave school. The approach is preventive, having seen women’s struggles in Bangkok, which include the lack of job opportunities, financial desperation, willingness to except low quality work, risk of exploitation and violence, and low self-worth and self-esteem. By reaching out to these young girls before many move to Bangkok, they will be better prepared for the future, as they will have the skills, knowledge and awareness they need to protect themselves and to make an economic success of their move to the city. The latest project also sees 40 disadvantaged women in Bangkok attend a three-month training programme, from October to December 2016, in English and in personal and career courses such as ‘Self-Assessment’, ‘Dealing with People’, ‘Thinking about the Future’, ‘Managing Change’, and ‘How to start Planning’. The curriculum has been designed to improve their employability. The progress of the graduates will be tracked through one-on-one mentoring and regular informal conversations. The Pratthanadee Foundation is delighted to be partnering with the Canadian Embassy once again. We’re delighted to work with the Canadian Embassy again after the success of our previous collaborations over the last few years in which 1,568 disadvantaged girls in Ubon were trained on career and personal development, women’s rights and the law, and basic self defence. The new project will be generously supported with funding from the Canada Fund and will undoubtedly enable us to more than double our impact to help girls from poor backgrounds in Ubon Ratchathani. And for the first time, the funding has been extended to training of disadvantaged women in Bangkok who have low level of education, are unemployed or in employment that is unstable, unsafe or underpaid.